Noodle sandwich? You’re kidding, right? 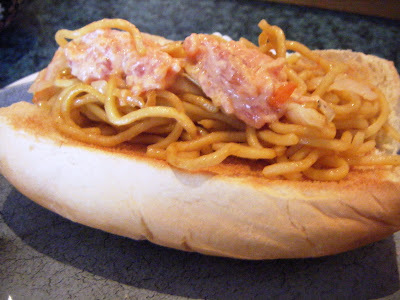 Apparently, yakisoba pan (aka fried noodle sandwich) is the Japanese equivalent of a ballpark frank or a mini-mart hot dog, but somehow it’s never come across my radar — till now. Given the frequency with which this “strange snack” is making its appearance around here lately, could a spike in the trend be far behind? I can see it already: gnocchi and guanciale on focaccia at Salumi! a linguine with fried clam sandwich at Ivar’s! “dork”-and-Barilla burgers at Lunchbox Laboratory! Could Nummy Noodle Sliders at Jack in the Box be next? What do you think?